Hawaiian Shirts, Bowling Shirts, Tropical Attire, & Retro Style Aloha Wear, Plus Sizes Too! Hawaiian shirts have a long and storied history in the 50th State. There have been numerous stories, fictions, and outright half-truths that have been perpetuated about the origins of the Hawaiian Shirt (known more popularly as the Aloha Shirt in Hawaii). We'll try to peel back some of the rumors, popular beliefs, and fables to bring you the actual tale of the evolution of the Hawaiian Shirt. Prior to the establishment of the Hawaiian Shirt in the fashion annals, Honolulu was a rather conservative, somewhat drab place from a fashion standpoint. Many have attributed the invention of the Aloha Shirt to Ellery Chun, owner of a Dry Goods store in Honolulu who sold the tropical print fashions in the 1930s. In truth, what we now know as the "Hawaiian Shirt" had already been in circulation for numerous years, although Mr. Chun had a major role in the Hawaiian Shirt's proliferation. 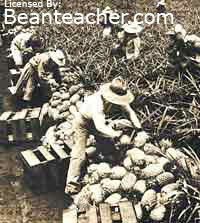 In the 1920s and 1930s immigrants from numerous countries began setting roots in Hawaii, seeking prosperity and a new life in what was then a Plantation town (primarily geared toward the growing and processing of Sugar Cane into refined sugar, and toward Pineapple harvesting). Bright Kimono cloth came from Japan, the relaxed and cool-wearing Barong Tagalog (an untucked shirt) came from the Phillippines, bright formal colored garments and silk came from China, the traditional collared shirt style came from the USA, and native Hawaiians provided their own traditional geometric block patterns, first seen on the Kapa Malo (loin cloth) and Kapa Pa'u (similar to a sarong). In Plantation-era Hawaii, the probable precursor to the modern Hawaiian Shirt was the Palaka Shirt and the Kimono-cloth shirt. The Palaka is a short sleeved shirt with bright geometric line patterns, that was widely worn by plantation workers. It has a plaid design, and resembles a checkerboard. Also popular during that time were short-sleeved shirts sewn by Japanese housekeepers and made out of leftover Kimono cloth, designed for Japanese boys and men. Ellery Chun was born in Hawaii in 1909. He attended Punahou School in Honolulu, and graduated from Yale University with a degree in Economics in 1931, in the midst of the Great Depression. After Yale, Chun returned to Hawaii to take over his Father's dry goods store in Downtown Honolulu, which had catered primarily to the local Chinese Community. Upon his return, and in an attempt to build business during the Depression, Chun expanded the scope of the store to appeal to a wider audience. He and his sister Ethel Chun Lum, began selling bright print short sleeve shirts made out of the leftover material from Japanese Kimonos. He also renamed the store King-Smith Clothiers (it was located on 36 North King Street in Honolulu). Meanwhile, during the same period in the mid 1930's, a business named "Musa-Shiya the Shirt Maker" was also making shirts from Japanese Kimono fabric. Musa-Shiya the Shirt Maker eventually evolved into "Musashiya", a fabric store that is still in business today at Honolulu's Ala Moana Shopping Center. The business advertised its "Aloha" shirts with a starting price of 95 cents per shirt! 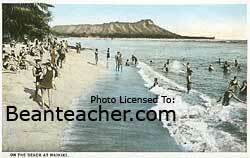 In 1932, Ti Haw Ho, owner of Surfriders Sportswear Manufacturing began making and selling its "Hawaiian" shirts. Thus, in effect, the celestial shirt stars began magically aligning to produce our modern Hawaiian Shirt. Some of the original Hawaiian prints sold by Chun included designs with Palm Trees, Hula Girls, and Pineapples. One of his tailors would make about 3 or 4 dozen at a time. Beginning in 1933, Chun was making his shirts out of cloth that was imported from the USA (at the time, Hawaii was a U.S. Territory, not a State), Japan, China, and Tahiti. Local Hawaii residents, and Waikiki beachboys and surfers quickly noticed the shirts and began buying them in ever-increasing numbers. Over time, tourists, Hollywood movie stars, and other rich and famous visitors to Hawaii also began noticing the bright, casual, easy to wear styles, and began bringing styles home to the U.S. mainland. After his success with the shirts in the early 1930's, Mr. Chun, trademarked the term "Aloha Shirt" in 1936. He continued selling his Aloha Shirts, and widely expanded his line, with his sister Ethel designing the fabrics and shirt styles. It was during this period that Ethel Chun Lum began creating the bright tropical fabric patterns that were based more on Hawaiian designs vs. Asian styles. It was this design shift that really established and cemented the modern Hawaiian Shirt style. In the late 1930s, the entrepreneurial Chun also began sponsoring a local radio talent show, which originated on the beach in front of the Moana Surfrider Hotel. The show provided his merchandise even more publicity and accelerated the Hawaiian Shirt's popularity even more. Chun became a member of the Board of Directors for American Security Bank in 1945. He later closed his landmark store and became a full-time Vice President for the Bank, where he worked until his retirement in 1966 (he remained on the Board until 1980, and remained an advisory director until 1985). Ellery Chun passed away on May 16, 2000 in Honolulu at the age of 91. Although he may not have invented the garment, he certainly popularized it, helped establish a staple Hawaiian industry, and helped assure the Hawaiian Shirt an enduring place in fashion history. By the 1950's, the Hawaiian Shirt had blazed into prominence. In August 1959 Hawaii became the 50th State of the U.S.A., bringing the new Aloha State even more attention, and most significantly, even more tourists! Hawaiian shirts also began receiving high exposure in Hollywood movies, and a succession of popular Hawaii-based TV-Series through the late 1950's, 1960's, 1970's and 1980's - but that's a topic for another Hawaiian Shirt article! 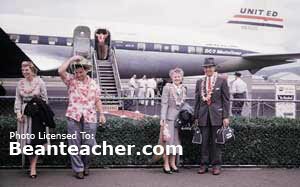 And, for an important historical footnote (we think so, anyway) - in August of 2001, your very own friendly neighborhood website, Beanteacher Hawaiian Style went live, throwing open its website doors to Hawaiian Shirt connoisseurs world-wide! :) Now you can wear your very own piece of Hawaiian history! 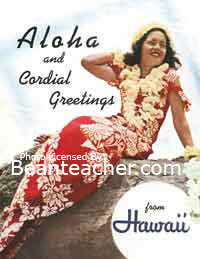 without the express written consent of Beanteacher Hawaiian Style.